"Handcrafted." That's the word Doug Murr uses to describe his new brewery, Dog Rose Brewing Co., as it moves toward opening later this summer in the historic Lincolnville area of downtown St. Augustine. 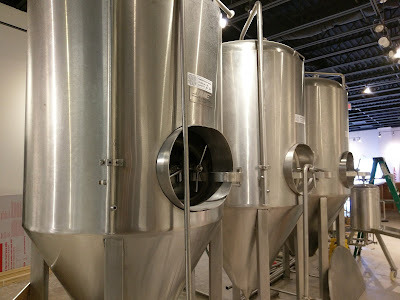 While still undergoing construction, the brewery is all about attention to details and giving brewery guests the experience and beers that they want. 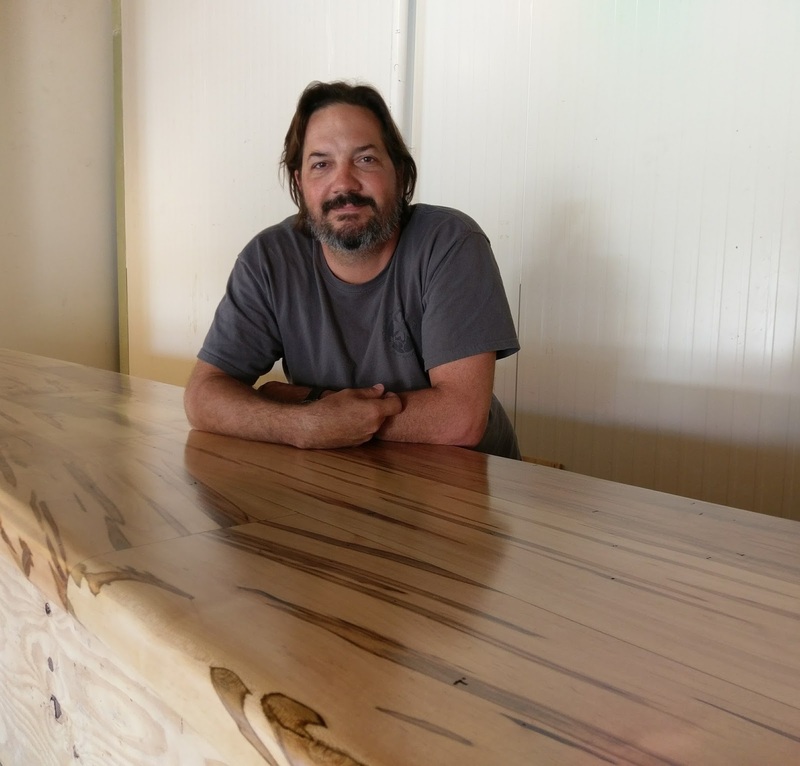 The beer, the bar, the tables - all handcrafted - says Doug. An experienced commercial brewer, Doug started homebrewing while living in Atlanta before relocating to North Florida. He began working at A1A Ale Works (St. Augustine) in June 2001 and became the brewpub's head brewer in 2002. There, he managed the brewery operations and produced 3-5 flagship beers for the company, along with creating new recipes. 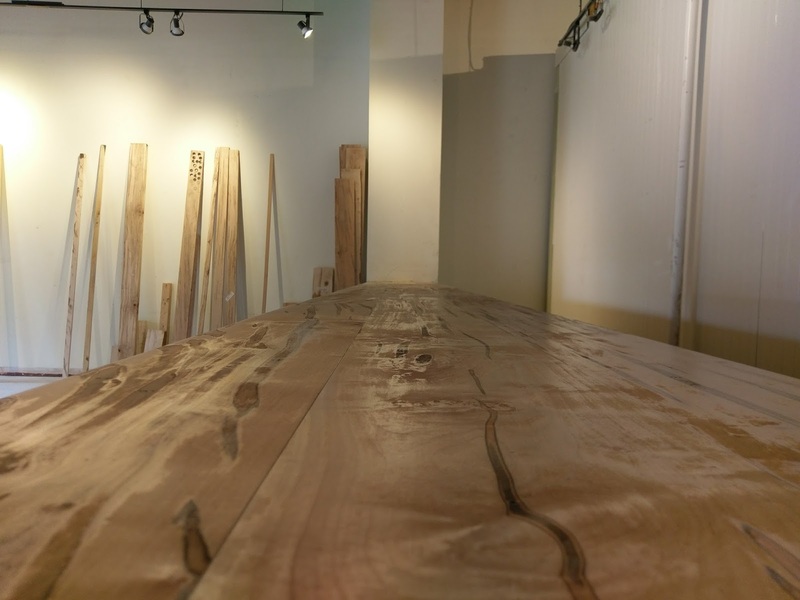 A few years ago, he looked to open his own place in St. Augustine and began working on a concept. Although close to signing a lease on a property at the time, things didn't take shape, and he continued to explore properties around the area. When A1A Ale Works ceased brewing operations at the end of 2016, Doug acquired the brewpub's brewing equipment. 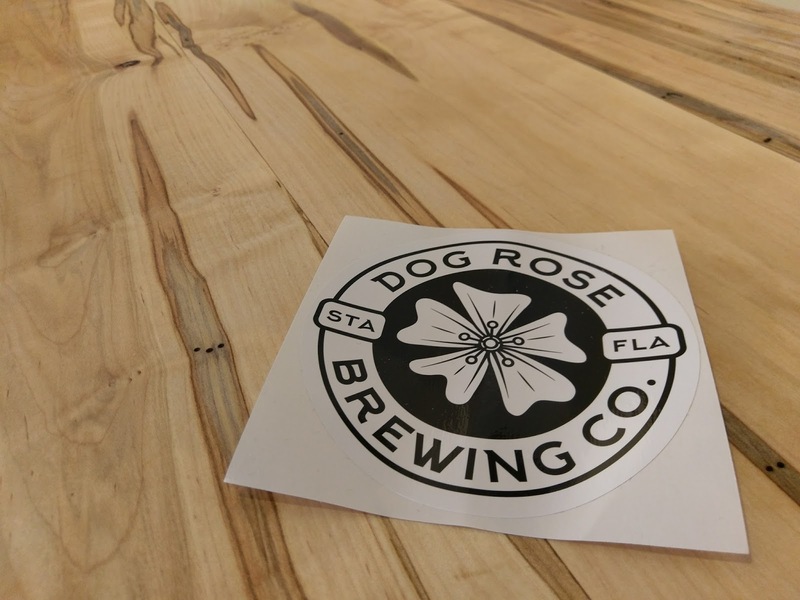 Things fell into place in February when Dog Rose Brewing signed a lease on a property in Lincolnville, and renovation of the building, which previously housed an art gallery, began. The city's newest brewery has a colorful exterior. Inside, the focus is the 30-foot bar that seats around 16 guests. The bar top is handcrafted from beautiful Ambrosia Maple boards, as will be the table tops. This is a fairly large place, roughly 5000 square feet, with the tap room and the brewhouse each covering about half of the space. Guests will have plenty of elbow room. Looking for activities to go with that beer? Try out the two professional dart boards or the 16-foot stand-up shuffleboard table. Don't know how to play shuffleboard? Not to worry -- a large poster will explain various games and the rules. The tap room also features a large picture window overlooking the street. A standing bar will line that area, so grab a brew and watch the sightseeing trolleys go by! The tap room will also include a couple of TVs. Track lighting is already installed around the bar and walls, which will be complemented by beer-related art pieces and concert posters. So, who's getting thirsty? When Dog Rose Brewing opens, expect to find all-house beers on tap from the get-go. The brewery won't experience "growing pains" with new equipment, because this is Doug's "baby," as he's already very familiar with the system. Federal Brewer's Notice in hand, he's ready to start brewing again, which should start within a couple of weeks. Ten draft taps will pour beer from ten serving vessels in the cooler. 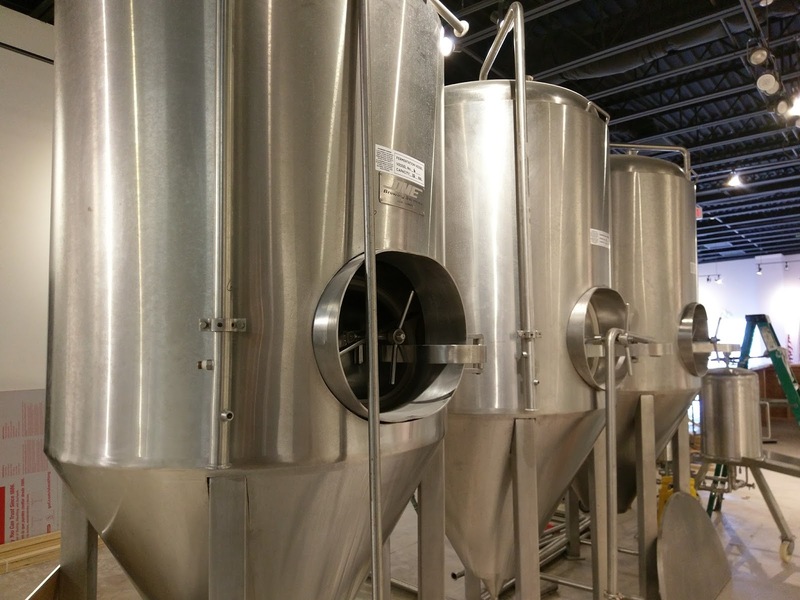 The 10-barrel brewhouse system includes three 10-barrel fermenters and three 20-barrel fermenters. In other words, there will be quite a bit of beer here. 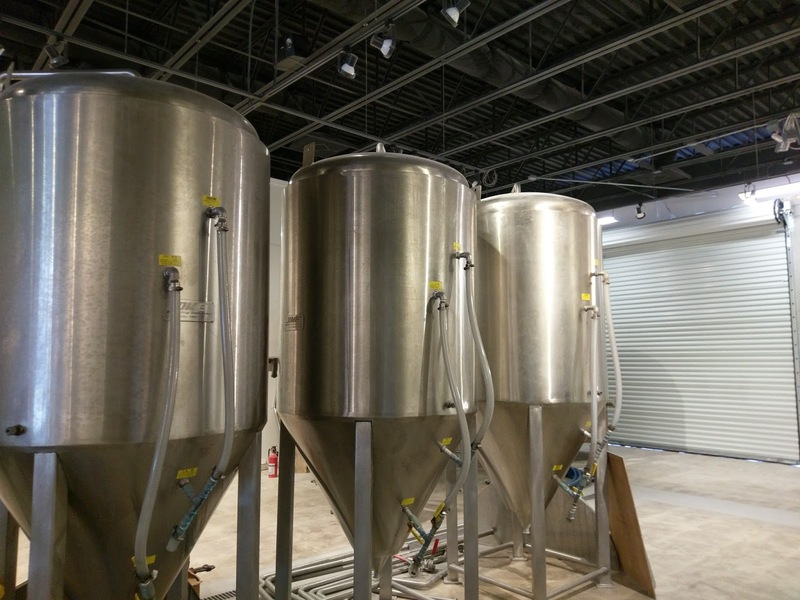 Fermenters on site, waiting to be filled! But don't expect copied versions of the former A1A Ale Works beers. While he "enjoys pushing the limits" of brewing beer, Doug also wants to "go back to basics" and serve "good, straightforward beers." Generally, the tap room will offer three or four flagship brews, along with five or six rotating beers, as Doug keeps "coming up with the next thing." He's always open to new ideas and "not following bandwagons." 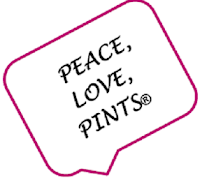 Look for a lighter-style beer, such as a lager, an amber ale and an IPA to always be on tap. Of course, some of the beers may "morph" over time, and some styles may depend on reactions from customers. And, yes, there will be a few barrel-aged beers. Who knows, there may even be a beer with rose hips down the line. What's the first beer Dog Rose Brewing will brew? Probably an IPA, says Doug, followed by a lager: a "filtered, polished light beer." Lastly, how did the name come about? After bouncing ideas around, Doug and his wife looked to flora and fauna for a potential name. The "Dog Rose" (rosa canina) is a climbing wild rose which can be found in Florida. Lore has it that the roots have medicinal qualities that can soothe dog bites. Or, there's a story that the flower is the "dog" of the rose family. Of course, there's also that famous quote from Shakespeare's Romeo & Juliet. Although business hours aren't set yet, the tap room will be open 7 days a week. Beer-to-go will be offered in growlers. 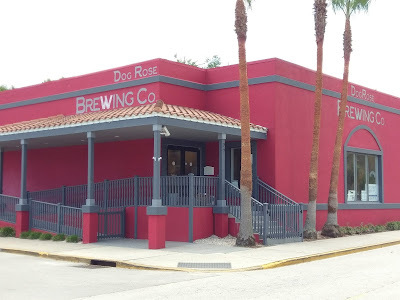 Dog Rose Brewing is located at 77 Bridge Street, in St. Augustine's Lincolnville district. The area is rich with history, as it was settled after the Civil War and is home to the city's largest collection of Victorian-era residences. It was listed in the National Register of Historic Places in 1988, according to the City of St. Augustine. Doug expressed his excitement to be a part of Lincolnville, and looks forward to giving the local residents a place to visit regularly. Excitement is growing at Dog Rose Brewing. A brewery by this name promises to be pretty sweet. I had an awesome time hanging out with Doug at the new Dog Rose Brewing earlier this week. 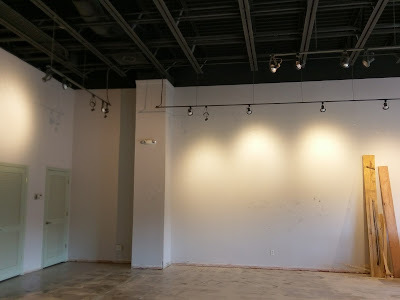 While there's construction dust and the humming of power tools right now, things will be taking form quickly, as furniture and additional equipment make their way inside. Thanks to Doug for the hospitality! And, Congrats!